The Girl in Black Stockings is a good noir film that finds a few murders taking place in a lodge up in Utah. Written by Richard H. Landau and Peter Godfrey and brought to life by director Howard W. Koch, they make you believe one thing throughout the film until finally showing the viewer that it is something else entirely. 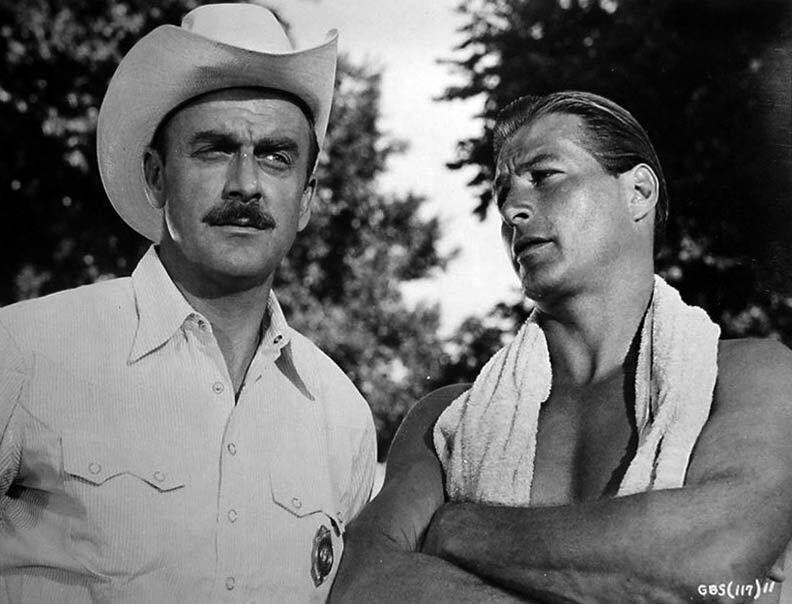 In the end, the film is a successful whodunit that could pass for any average procedural in this day and age, yet with its great black and white cinematography, including a few good performances, it still stands as a pretty decent picture. All David wants to do is get away from it all, which is the reason he finds himself up at this lodge run by a brother and sister. David soon falls for a woman named Beth who works for Edmund, the owner of the lodge and not long after, the first body is discovered. The person who is immediately suspected of the murder is Edmund whom the sheriff thinks is faking his paralysis. Throughout the rest of the film, or at least for a good bulk of it, the viewer is made to think that Edmund is still to blame and that the man is still faking his condition. Edmund hates women for the most part and is angry at himself and at life and out of everyone, is the most logical suspect. The police do look at other people and as the bodies start to pile up, and are no longer limited to women, it is hard to say who is guilty and who is not. The most interesting character throughout the film is that of Edmund played by Ron Randell. Being a paralyzed man and having much of the film centered on him and his resort is one thing that really stands out from many other movies in the same genre. 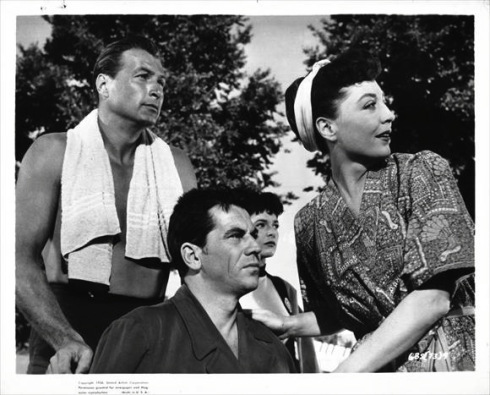 Lex Baxter’s character David as well as Anne Bancroft who plays Beth along with Marie Windsor and the rest of the cast are like cardboard cut-outs, characters that you have seen many times in many movies and while they do a good job in their roles, it is Randall who stands apart as the very unlikeable Edmund. 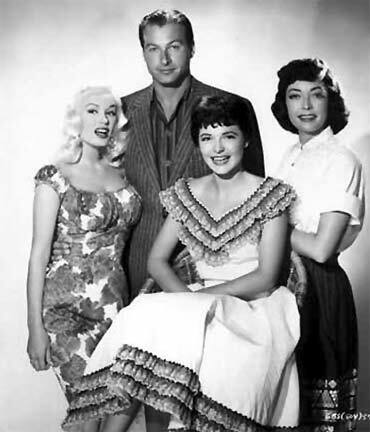 There is one other person in this film which made it more memorable than not, who is displayed prominently on all of the posters for the film and that is Mamie Van Doren, who was famous not so much for her acting ability but for other more tangible assets. 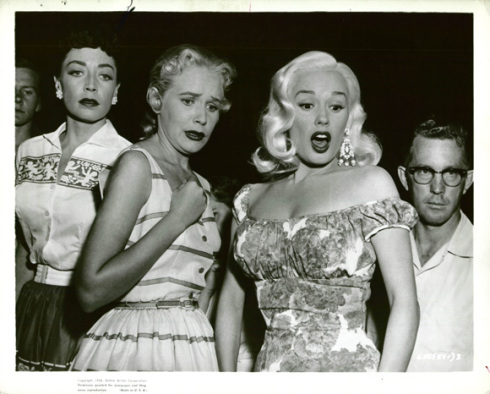 In fact, people would go to see a Mamie Van Doren picture whether she spoke or not, but as it is, she does a fine job with the few lines she has and her scene with Randall momentarily stole the show. This film does not rewrite the book on mysteries, thrillers or that which used to be so popular many years ago, the noir, but it does a solid job of telling a fairly average story. There are better movies that tell the same tale, though not too many can claim to have the lovely Mamie Van Doren in their picture. So for those that like classic noir films or simply buxom blondes, then you cannot go wrong with The Girl in Black Stockings. I NEED that film poster in my living room!!!!!!! I know right? Love the classic film posters. Me too. I have a couple from different movies – just need more wall space to put them up. You should take photos and do a post on them!! I know it’s already been said, but the poster are looks great. Not too long after Anne Bancroft completed The Girl In Black Stockings (1957, United Artists) she had grown dissatisfied with the roles she was getting and left the film industry. Anne Bancroft was one of the few actresses that was able to leave Hollywood and then reinvent herself as a dramatic actress and then receiving an Academy Award for the Miracle Worker in 1962. When Bancroft returned to Broadway her first play was Two For The Seesaw, after receiving excellent reviews Bancroft was awarded the Tony Award for Best Performance by a Featured Actress in a Play as Gittal Mosca costarring Henry Fonda and the play was directed by Arthur Penn. Bancroft then began work on her second dramatic play The Miracle Worker which premiered on Broadway at the Playhouse Theater on October 19, 1959, and closed on July 1, 1961, after 719 performances and the production was directed by her good friend Arthur Penn. When Hollywood came calling Bancroft and Patty Duke were able to reprise their roles on celluloid. Both actresses received Academy Awards for their amazing performances. Now Bancroft could pick and choose her roles from now on.